There appears to be a limited but vital audience for this newish series, Eli Explains It All, so once more the Bunny Brings Enlightenment. An everygreen amongst the ignorati is that backradiation can't heat the ocean because it is all absorbed in the first millimeter or less. And indeed this is true, the distance that IR light radiated from greenhouse molecules penetrates into water is a few wavelengths. That distance is called the skin depth and it is not without consequence in some interesting and amusing ways as St. Jackson has taught us (well some of us). Yet, as Einstein teaches us, the world is not malicious, but it is subtle, and the reason why heating the surface warms the ocean is closely related to why increasing greenhouse gases warm the Earth. Eli will now explain. Others have done so, Real Climate for one, but the Bunny has another simple picture that USAns can use on their uncs in a couple of weeks. Start with the observation that sunlight is absorbed in the first few meters of the oceans. How deep depends, of course, on what other kind of crap is there, bio and anthro, but for arguments sake a few meters. That warms the top few meters, but the surface, that skin layer cools by evaporation. Heat from the mixing layer will move by convection to the cooler skin layer. Now comes the elegant part, back radiation warms the skin layer. That means back radiation decreases the temperature difference between the skin layer and the mixing layer, Since convection depends on temperature difference, the rate of heat loss from the mixing layer decreases. 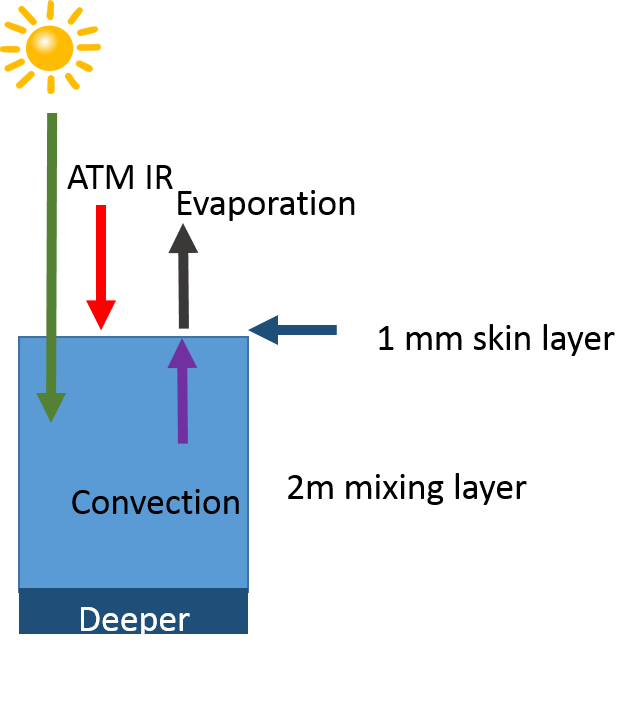 Thus the mixing layer will be warmer than it would be without back radiation and the extra warmth will be carried into the deeper ocean by conduction and currents. [T]he atmosphere admits of the entrance of the solar heat, but checks its exit; and the result is a tendency to accumulate heat at the surface of the planet. The ocean surface admits of the entrance of the solar heat, but infrared surface warming checks its exit; and the result is a tendency to accumulate heat in the oceans. If I could be so bold. I found this comment from your real climate link useful to help me fully understand you post. As an oceanographer working on air/sea interaction and mixed layer dynamics, I hope I can clarify this issue somewhat (in fact, I’m at sea right now on the R/P FLIP, gathering data to study wave and mixed layer dynamics, but this is off the point). I think a major aspect of the balance has been glossed over: the ocean is heated mainly by the visible part of the spectrum, the energetic part of the sun’s glare. This penetrates several meters (blue-green can penetrate several 10’s of meters, particularly in the clear water found away from coasts). 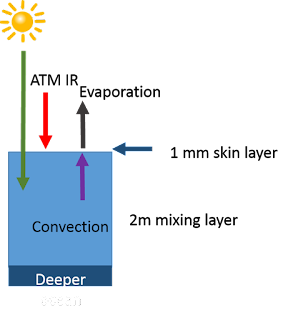 In contrast, the only paths for heat LOSS from the ocean are infrared (blackbody) radiation and latent heat (evaporation). The sun heats the uppermost few meters; this has to find its way to the actual very thin surface layer to be lost. In equilibrium, then, there is a significant flux toward the surface a few cm under, and the sense of flux from infrared alone has to be significantly upward. Given this, it is quite clear that any reduction in the efficiency of upward radiation (by, say, reflecting it right back down again), will have to be compensated for by increasing the air/sea (skin) temperature difference, hence having a warmer subsurface temperature. This still leaves aside the latent heat flux, which in general accounts for something like half the upward heat flux. The balance is NOT, as portrayed here, between up and down infrared; rather it is downward “visible” (including ultraviolet, even), versus upward NET infrared and latent heat fluxes. I've always thought JA Smith's comment muddies the water. It explains land, or a rock, but not the oceans. The atmosphere that is in contact with the skin layer is generally colder. The energy in the skin layer should readily pass into the atmosphere. It doesn't. In that RC article Minnett was proposing a physical mechanism that explains how it is that the energy in the tissue thin layer is not readily passing from a very warm skin layer to a predominately colder atmosphere. Back radiation creates a gradient: a layer within the skin layer that is a lot warmer than the water coming into it, and warmer than the water above it, and that is where the whole thing slows down, which means an energy buildup in the oceans. An interesting term here. When you see lightly clad bunnies gathering around a source of infrared radiation, they clearly haven't been told that it can't warm them. I have always been puzzled by this one. As far as I can tell no "subtle" models are required - back scattered IR from CO2 get absorbed by the oceans and the ocean warms as a consequence - end of story. The skin layer is going to mix. The customary heat sink for a powerful CO2 welding & cutting laser beam is a water barrel- the fluid surface boils vigorously as the skin layer eats the 10.6 micron flux. Nick, Eli and Ms. Rabett call them snuggle photons. Eli - very elegant argument. Do you have any numbers for convection suppression? Tricky question, since the temperature dependence of water density is not monotonic, and freezing sea water sheds denser brine even as new frozen ice covers its surface. Thanks, Eli. Helpful as always. Nicely done, Eli. I would have thought mixing of the few millimeters at the top with the water under it would have played a role as well, but perhaps not. Now comes the elegant part, back radiation warms the skin layer. That means back radiation decreases the temperature difference between the skin layer and the mixing layer, Since convection depends on temperature difference, the rate of heat loss from the mixing layer decreases. This language confuses me. Net, energy flows from hot to cold. So to slow down the flow of energy out of the oceans, it would seem to me the energy flow would have to hit something that is warmer: essentially the middle of the skin layer during daylight. Wouldn't that be an increase in the temperature difference between the skin layer and the mixed layer. Unknown- as I understand it (I'm a philosopher of science, not a thermodynamics expert, so don't invest too heavily here), the argument begins with the point that the surface 'skin' is cooler than the water below due to evaporation. It follows that an increase in the surface temperature impedes upwards convection near the surface, and this in turn slows heat loss from the deeper water to the skin where it could radiate directly into the atmosphere. More succinctly, the IR warming the cooler 'lid' on the warmer waters below makes it harder for those warmer waters to reach the surface, where they could shed their heat back into the atmosphere. JCH, don't get caught up on the details, as in all thermo problems, the issue is the flows across the boundaries and you don't have to worry much about what happens to the energy inside the systems.